For the past 18 years, the Alliance has run its highly successful summer tutoring program called ‘Ready Set Learn’. Each summer, up to 25 tutors work one-to-one with close to 800 elementary-aged children who struggle in school. The success of this summer program combined with the needs of Island children have led the Alliance to work at expanding this into a year-round program. You can help the Alliance achieve their goal by donating today or anytime during their Give the Gift of Literacy This Holiday Season campaign. This campaign was launched today on #GivingTuesday – a global movement for giving and a time when charities, companies and individuals join together and rally for their favourite causes, such as literacy. Children who participated this summer expressed valuable lessons they learned: “I learned I was smart”, “I learned that if I try hard, I can actually do it (math)”, “I learned that I like to read”. These quotes speak to what the Alliance is working on – building confidence and literacy skills. Last month, the Alliance asked 17 schools if they would like to be considered for the pilot expansion. These were the schools near the Alliance’s chosen pilot locations – four PEI Public Libraries. All but one said they were interested, and the Alliance did a draw to choose the seven elementary schools that are taking part in the pilot. They are: Greenfield, Elm Street, Prince Street, Sherwood, Englewood, Georgetown and Cardigan Consolidated. 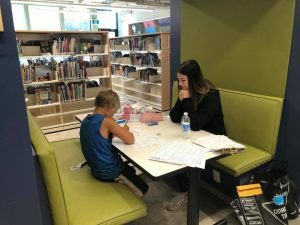 While the Alliance has secured funding to run this pilot, it has not yet secured funding to run the program with 20 tutors during the 2019/2020 school year. The Alliance thanks the following organizations for supporting the pilot program: The Rotary Literacy Foundation, The Guardian and Journal Pioneer’s Newspapers in Education Program, United Way of PEI and the Government of Prince Edward Island. You can help the Alliance achieve its goal of helping 1600 children annually. Donate today online or call Executive Director Jinny Greaves at 902-368-3620.